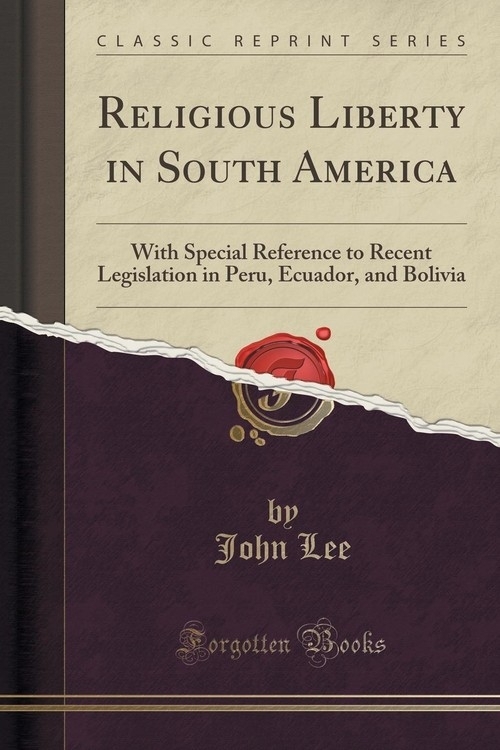 Excerpt from Religious Liberty in South America: With Special Reference to Recent Legislation in Peru, Ecuador, and Bolivia<br><br>This volume contains a brief account of the movement for religious liberty in the South American Republics of Peru, Ecuador, and Bolivia. The movement had its inception in an address by the Rev. Dr. John F. Thomson before the Methodist Ministers&apos; Meeting of Chicago, Illinois, on Monday, April 2, 1894. At the close of the address a committee of three was appointed to make representations to the Roman Catholic authorities, and for six years thereafter the agitation was maintained under the direction of this committee.<br><br>About the Publisher<br><br>Forgotten Books publishes hundreds of thousands of rare and classic books. Find more at www.forgottenbooks.com<br><br>This book is a reproduction of an important historical work. Forgotten Books uses state-of-the-art technology to digitally reconstruct the work, preserving the original format whilst repairing imperfections present in the aged copy. In rare cases, an imperfection in the original, such as a blemish or missing page, may be replicated in our edition. We do, however, repair the vast majority of imperfections successfully; any imperfections that remain are intentionally left to preserve the state of such historical works.